Imagine yourself at a five-star Fairmont resort on the beach in Maui, listening to the waves. You’re perfectly relaxed, and your vacation is especially gratifying because you bought it a fundraiser to help Virginia Mason deliver lifesaving care. 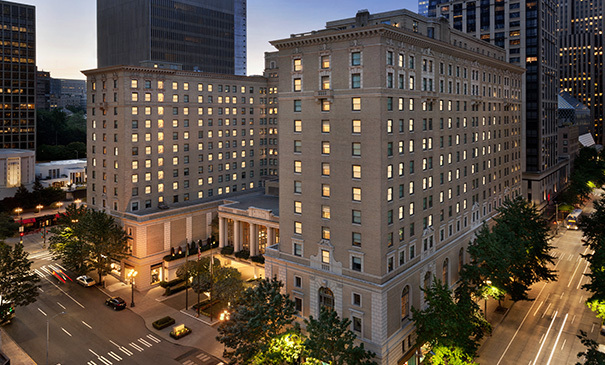 Fairmont Olympic has been donating hotel stays to help raise money for Virginia Mason for more than a decade, as part of the hotel’s larger push to support the community around it. Fairmont Olympic has fueled Virginia Mason’s work in a variety of ways. For example, they worked with us to apply aspects of their world-class hospitality approach to patient care, so we can try to give each patient a perfect experience. They also donate certificates for stays at luxury properties worldwide, so we can auction them off at events like Dreambuilders. Last year, these donations helped this event bring in more than $4.5 million – a new record! What’s more, the Fairmont Olympic in Seattle hosts an annual Corporate Partner Breakfast with Virginia Mason Chairman and CEO Gary Kaplan, MD, where we recognize our corporate partners – an appropriate location since our relationship with the landmark hotel started at the beginning of our corporate partner program nearly 15 years ago. “Both our organizations care deeply about keeping the Puget Sound community healthy and vital, so it makes perfect sense for us to support the extremely important work that Virginia Mason does,” says Markus Treppenhauer, the hotel’s general manager.